An area on the PCB that is covered with a thin copper layer is called copper fill. Copper fills are used to create a ground plane. 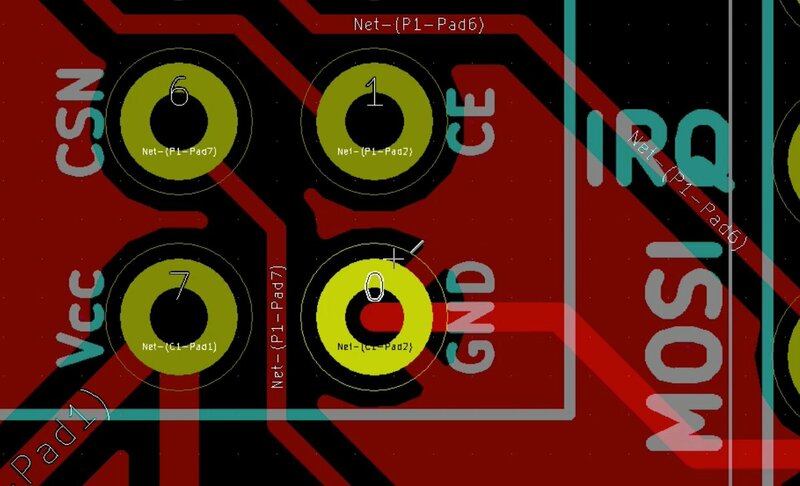 A ground plane is an area on the PCB that is grounded by being connected to one or more ground pads. Pads that are should be connected to ground can be connected to the ground plane via small traces. These traces are often called “thermal reliefs”. An example of a thermal relief. Notice the small traces connecting the bright coloured pad in the middle of this image, to the purple-masked copper fill. The thermal relief allows for sufficient electrical connection between the pad and the copper fill, while at the same time restricting the amount of thermal energy that is dissipated from the pad to the copper fill. This is important for achieving good soldering. If the pad was connected directly to the copper fill, then too much thermal energy would dissipate making it hard to keep a high enough temperature in the solder. 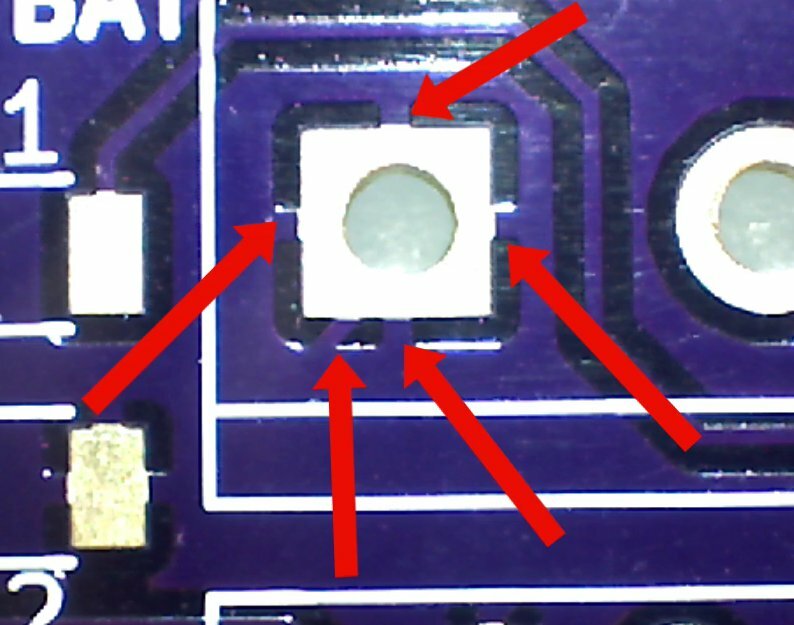 This would result to a failed soldered joint between the pad and the component pin. You can also create a copper fill that is not grounded. Instead, you can attached to a VCC pad. In 2-sided PCB, the typical configuration is to create a ground copper plane in the bottom layer, and a Vcc copper plane in the top layer. In the circuit for the current project we will create a ground plane and cover as much of the top copper area as we can. In the next two projects we’ll be creating a Vcc plane on the top layer and a ground plane in the bottom area. Start by clicking on the Add Field Zones button. Let’s get started. 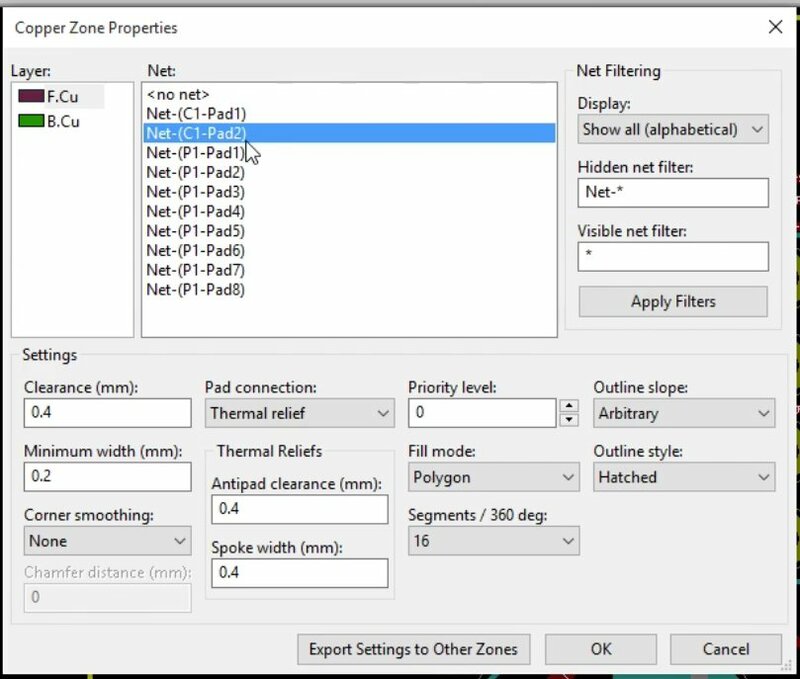 To create a copper fill start by clicking on the Add Field Zones button. This will change your cursor into a cross. You can then start creating the new zone. Make sure that the top copper layer is selected (F.Cu), and click on the top right corner of the PCB. Working on F.Cu, click on the top right corner of the PCB to start creating the new zone. The first zone click will bring up the Copper Zone Properties window. The first click will bring up the Copper Zone Properties window. 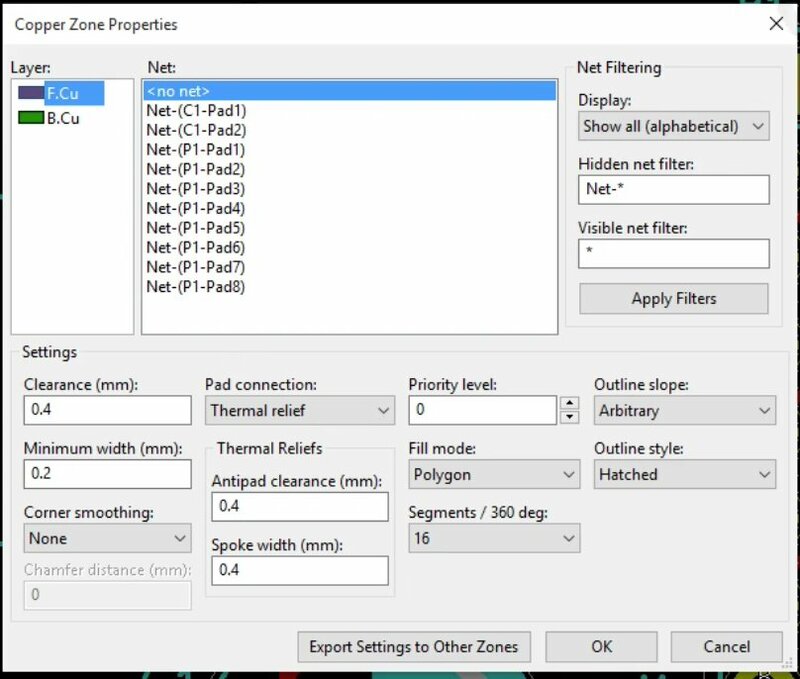 The two important settings to make here are the layer for the fill, and the net you would like the zone to be connected to. In this project, we are working on the top layer only, so for the layer, choose “F.Cu”. Next, in the Net box, there are several nets listed. Which one is the ground net? Each trace has the name of the net to which it belongs written on it. In the next project, I will show you how to give nets a custom, easy to recognise name. 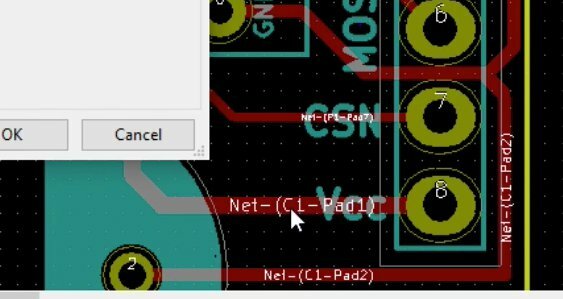 In this project, the nets were automatically named by Kicad. To figure out which of the listed nets is the ground net, have a look at the traces. Zoom in if necessary. 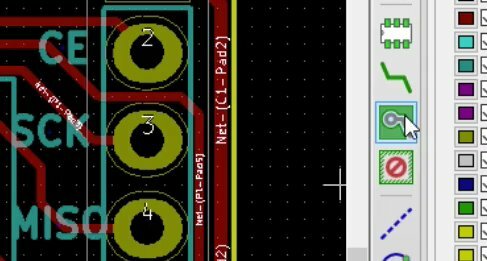 In the screenshot above, you can see that the trace connected to the Vcc pad has the text “Net – (C1 – Pad1)” on it. This is the name of the net to which this trace belongs to. Also look at the trace that is connected to the GND pads. The name of that net is “Net – (C1-Pad2)”. This way, you can determine the name of the net to which a wire belongs to. The Net-(C1-Pad2) is the ground net. 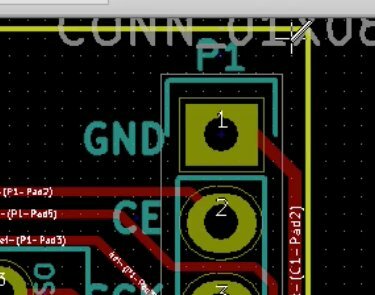 Draw the zone edge along the edge of the PCB. Click to create an edge. To complete the zone, double-click. Notice that the zone is marked by short red hairlines. 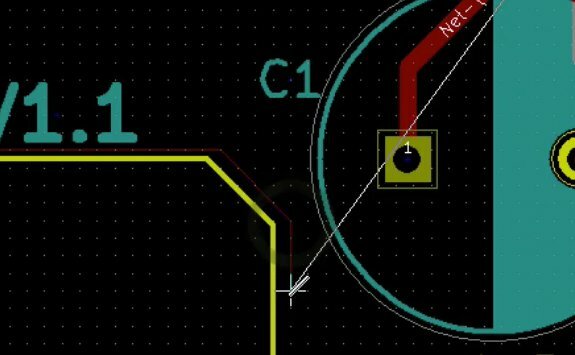 Draw the edge of the zone as close as you can to the edge of the PCB. 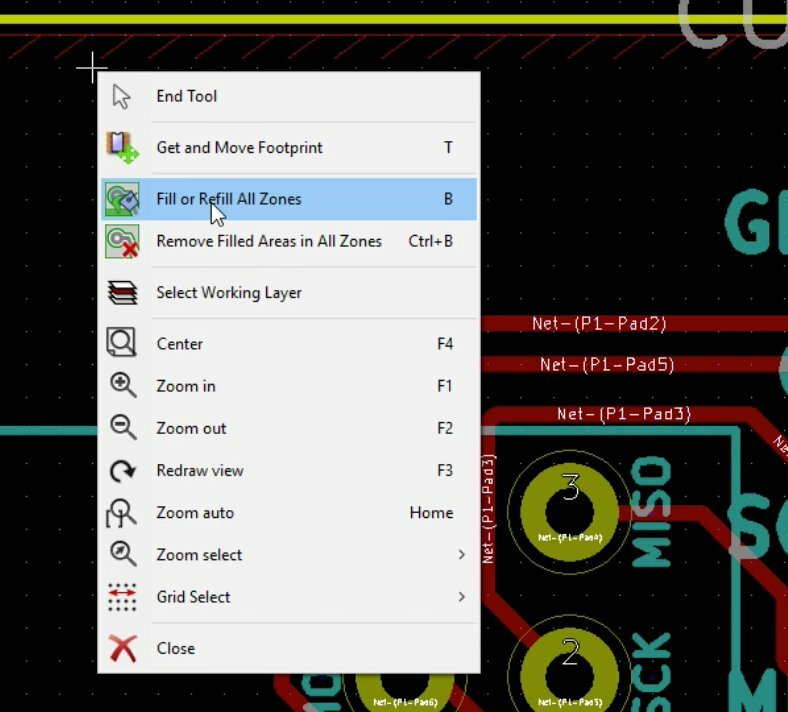 Go around the edge of the PCB, clicking to create an edge. 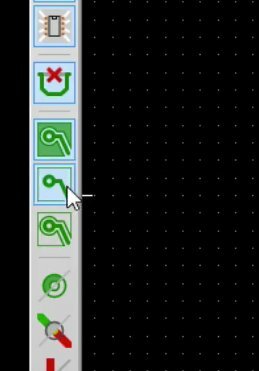 To close the zone, double click on the point where you started from, at the top right of the PCB. If all this is done correctly, the zone will be created. You will see the red outline, and the small red hairlines pointing inwards. They are read because we are working on the top copper layer, which is designated by the red colour. If we were working on the bottom layer, the traces and the outline of the zones would be coloured green. The next thing to do is to fill this area with copper. Right-click inside the zone, and select Fill or Refill All Zone. Right click anywhere inside the zone and then choose “fill or refill all zones”. The zone is now filled. The red area indicates that copper is filled where is possible. You can also notice the thermal reliefs in the ground pad. This button allows you to toggle copper fills on and off. 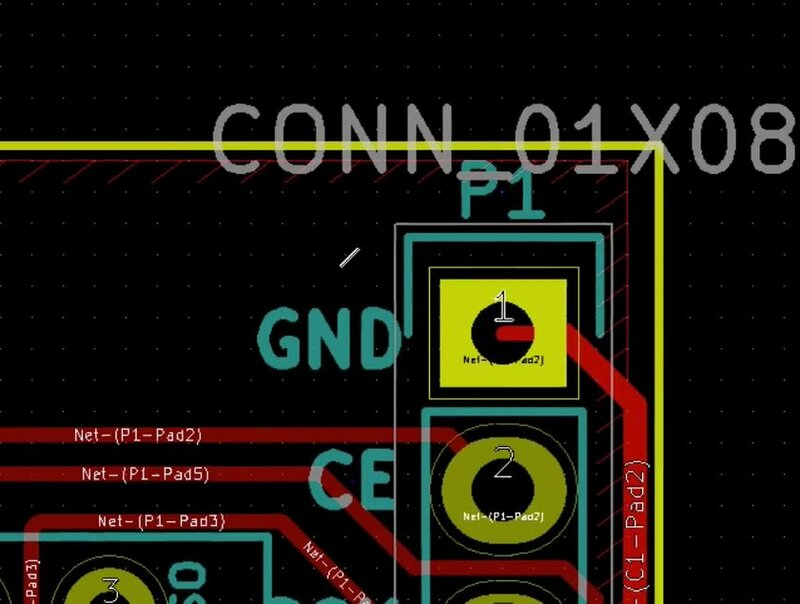 If you would like to have a look at your board without a copper fills showing you can just make them invisible, so you can click on the “Make zone fills invisible” button. You can make the zone fill visible again by, clicking on the “Make zone fills visible” button. Let’s do another ERC to make sure everything is ok. In the next section, I will show you how to export the Gerber files upload the PCB to the manufacturer.